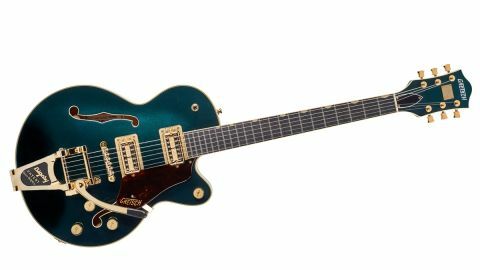 Gretsch is determined to shake the ‘for rockabilly only’ vibe of its instruments, and we think the Players Edition Centre Block series is set to do just that. We could lose the master volume control. The Jr has a definite Gretsch-y look with its gold hardware, Bigsby, ebony ’board and cool gold Broadkaster headstock nameplate. (The Broadkaster name, of course, was originally used on a Gretsch drum kit and was the reason why Fender had to change the name of its early solidbody from Broadcaster to Telecaster, thus causing the nameless ‘Nocaster’ in the process). Build quality is stunning, the Cadillac Green of the Jr is a real head turner. The Bigsby could be adding to or subtracting from the sonic soup, but without otherwise identical instruments side by side it’s hard to tell. ‘No-load’ tone pots mean that, when set wide open, the signal bypasses both pot and capacitor for the clearest possible tone, but knock it back from the notched ‘open’ position and it works like a normal control. Suffice it to say, this guitar leaves a very pleasing impression on the ears as well as the eyes. Japanese build quality is beyond reproach, and the range of options available means there’s something for everyone.